When I was a less experienced mother, with smaller, younger children I would frequently take my kids with me where ever I went. Mostly because I was too poor to pay for a quality sitter and I didn't quite trust that homeless guy in town who promised to sit for free if only I let him have my empties and unlimited access to fresh towels. How's that for some quality maternal instincts? Other than that homeless guy there really wasn't anyone else who could watch my kids. I tended to exhaust any family resources I had with Shale's unending hospitalizations and medical appointments. I never wanted to ask for babysitting unless it was medically related for one of my children. It never occurred to me to ask for sitting if I was the one with the doctors' appointments. I mean, it's totally normal for women to bring three feral smalls to a gynecologist's office, hand them a few speculums, some wooden tongue depressors and then tell them to play nicely while their mother's insides are probed like an alien? Right? Over the course of the years though, I got better at passing off my children onto people so that one magical day I was able to wander about in public without any children hanging off of me. That sound you heard? The voices in my head all lined up like a choir to sing Hallelujah, Leonard Cohen style. I've now grown so accustomed to being out in public without any children with me at all I almost start to worry I've forgotten how to do it. Now that my smalls have morphed into ridiculously good-looking and talented teenagers (they take after me) I've had less opportunity to even consider taking all three of my kids out in public than normal. Mostly because my older children have instituted some weird personal rule about not being seen with me outside the domain of which I own. Jumby, however, still loves me best. He's a good boy and quite possibly my favourite as of this minute. But this weekend, the stars aligned just so that Jumbster needed diapers, I had to pick up Frac's new glasses and possibly some pants to fit the poor boy since everything I bought for him in September now only reach the tops of his ankles and Fric informed me that she was in dire need of a costume for her upcoming musical theatre production. Oh and she needed it by today. Thanks for the 18 hours notice kid. Which is how I found myself with three children and a wheelchair in a mall on a Sunday afternoon. With absolutely no chaperone. Shopping with teenagers is a wildly different experience than when I used to take my smalls out shopping with me. First of all, I can't strap them in a buggy no matter how often I threaten to do so. Secondly, neither of them wants to hold my hand. And oddly enough, they don't like being asked if they have to go potty every five minutes. There were perks. I never had to worry about navigating Jumby's wheelchair through narrow aisles in cramped stores. Mostly because Fric and Frac threatened to gnaw off my hands if I claimed ownership of their little brother. Jumby: The newest status symbol for cool teens everywhere. Who knew? And those heavy bags no one likes to schlep around? That's what teenagers are for! I called it a muscle building exercise. And best of all? 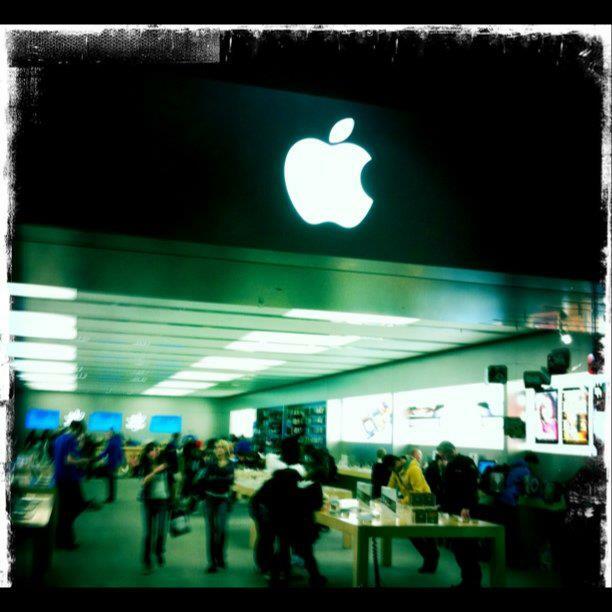 Whenever my teens started to step out of line all I had to do was threaten to not let them go into the Apple store. Instant obedience! It was pure magic. Oh Steve Jobs. Your legacy is a teenager's crack. Withholding you makes them twitch. More effective than Santa Clause ever was. The day turned out to be wildly successful if you don't count that one moment when I was clucking very loudly and flapping my arms like a chicken, causing Jumby to cackle hysterically. We were having a great time, even if people were starting to stare. I still don't know why Fric and Frac pretended they didn't know us and walked really fast away from the two of us. It turned out okay though because Jumby and I just chased after them, yelling their names REALLY LOUDLY throughout the mall until we finally cornered them. As I was loading everyone back into our vehicle to make the pilgrimage back home I realized that there was an expiration date on these family-shopping outings together. Soon enough Fric and Frac will be going in their own directions, leaving the Jumbster and me to shop on our own. I'm not quite ready for that just yet. How did I go from needing a babysitter all the time to wishing I still did? The good news is I've got at least a few more good years ahead of me to perfect the art of mall shopping with my teens. And if there is anything I've learned over the years and was reminded of just yesterday, it's that one child's embarrassing moments is this mom's most treasured memory. I can't wait till someone needs socks and underwear so we can go back to the mall and do it all again.